No Fenders -Formula 1, IndyCar and A Whole lot more..: AUTOS: Thee Ultimate Art Car? My-Oh-My! Mr. Mariner Dave Niehaus, where does the time go? As I simply cannot believe that this story has been percolating; Err fermentin’ for some two years now; YIKES! 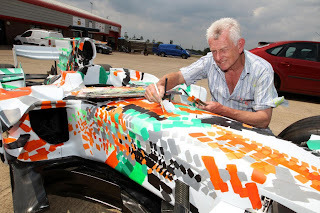 As perhaps Y’all heard ‘Wayback in the summer ‘O Twenty-eleven’s British Grand Prix that Force India would be auctioning off a very special one-of-one VJM-01 Formula 1 chassis for charity, as I have NO idea what the Art Car fetched? As I suppose I knew I-T all those years ago, but now find it karmic that I’ve actually conversed and had my picture taken with the chauffer of the real Lola T93/00 Ford IndyCar driven by Buddy Lazier for Leader Cards during the ’94 season a year ago at Mother Speedway!